Wanganui was a garrison town from 1846 to 1870, the period during which the British Regiments were stationed in Wanganui. The Rutland stockade and blockhouse was built in 1849 by Sgt William Spiers-Russell and is one of the few city hotels to remain on its original site. The Rutland Hotel was named for the English county of Rutland in honour of the regiment which manned the stockade in 1847. It is thought the hotel was built to cater for nearby thirsty soldiers. Over the years the Rutland Hotel changed hands many times, suffered several major fires and withstood earthquakes. The hotel was burned completely to the ground in 1868 and severely damaged by fire again in 1880, 1903, and 1946, each time rising from the ashes to once again cater for travellers and locals. In 1986 the Rutland closed and all fittings, including the doors and staircase, were put up for auction prior to demolition. Luckily, the demolition didn’t proceed and the derelict building was bought in 1993 by two local Wanganui men and restored. Today, the Rutland remains an iconic building in the heart of Wanganui, lending history and elegance to one of the town’s most prominent street corners. Known in its early days as “the finest hotel between Wellington and New Plymouth” and a place where “professionals dallied, did business, and generally enjoyed themselves”, the Rutland once again caters for elegant guest accommodation and makes for a very enjoyable stay. 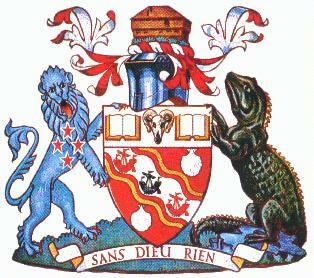 The Wanganui District Council Coat of Arms showing the Rutland Stockade on top.